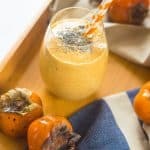 Persimmon smoothie recipe – this delicious Asian fruit makes the most perfect autumnal smoothie with coconut milk and frozen bananas. While I do not like the cold weather I do like the whole range of fruit and veggies that the supermarkets like to stock. 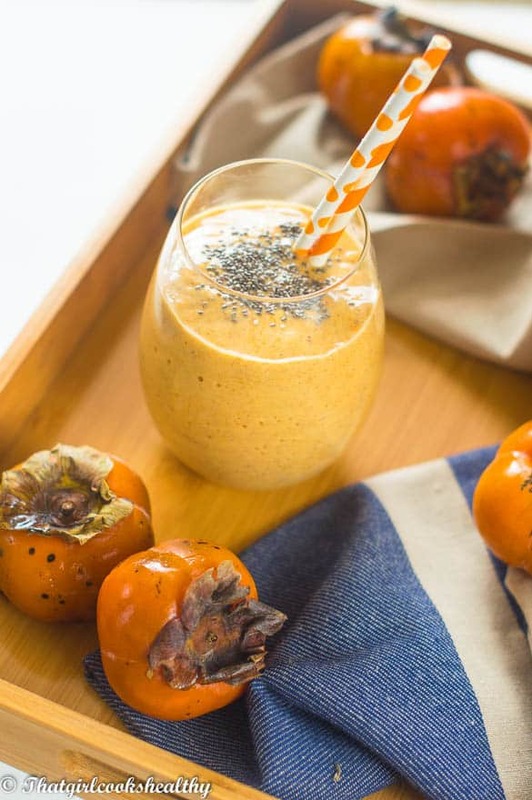 One of my favourite Autumnal fruits is persimmons, a percy what? 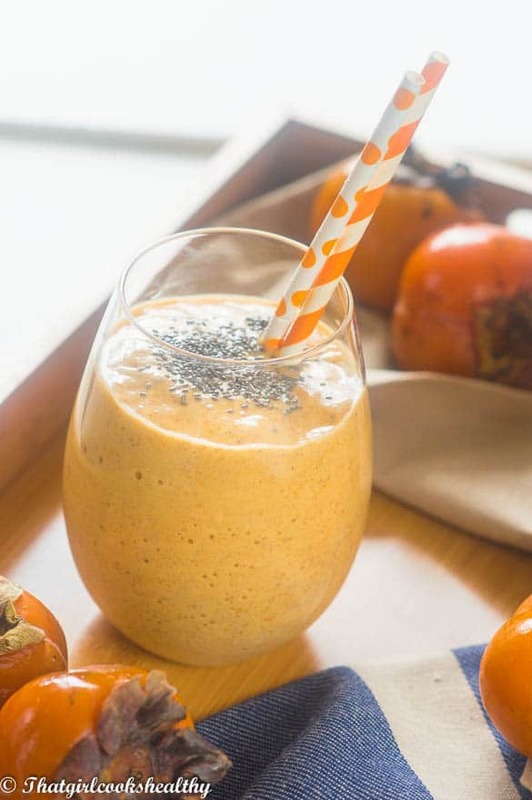 I repeat PERSIMMON and even more as a persimmon smoothie recipe. I had that what-the-heck-is-this-fruit expression on my face too a few years ago. I’m so glad that I gave this little bad boy a chance to redeem himself because I take great pleasure in eating him every chance I get. On second thoughts, I better stop referring to the persimmon as a male because you guys will render me insane and run for the hills. On a serious note, the persimmon fruit is bright yellow/orange in colour, oval shaped, smooth and very juicy when ripe. The fruit derives from East Asia and is popular amongst the western hemisphere doing the cooler months. In terms of vitamins they are high in vitamin A, C and B complex. 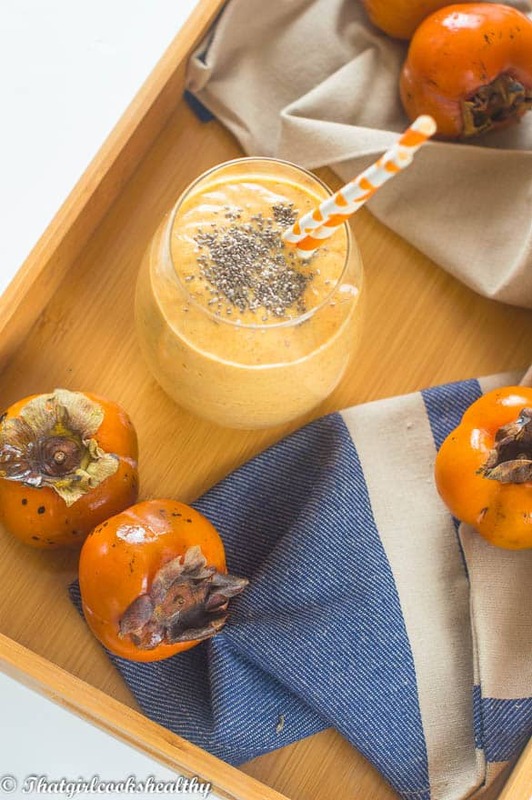 Persimmons are loaded with antioxidants which ward off free radicals – the molecules responsible for tissue damage. An antioxidant compound called Catechins are believed to be anti-inflammatory, anti-infective and stops excessive bleeding in small blood vessels. Along with the vitamins, you’ll find a healthy range of minerals, namely copper, potassium, zinc and manganese – all of which support enzymes and facilitate the functioning of the cardiovascular system. All of the ingredients to a blender and blitz until a smooth consistency is achieved.